Feeling hopeless, helpless, or depressed can result in extreme emotional pain and desperation. Sometimes these feelings result in thoughts of suicide, but it is important to let the person with these thoughts know that there is help and hope. If you or anyone you know is having suicidal thoughts, talk to a trusted adult or call 1-800-273-TALK (8255) or text "START" to 741-741. Suicide rarely happens without warning. As a peer, you may be in the best position to recognize when a friend might need help and help them get it. You may see signs in person, hear about them secondhand, or see them online in social media. 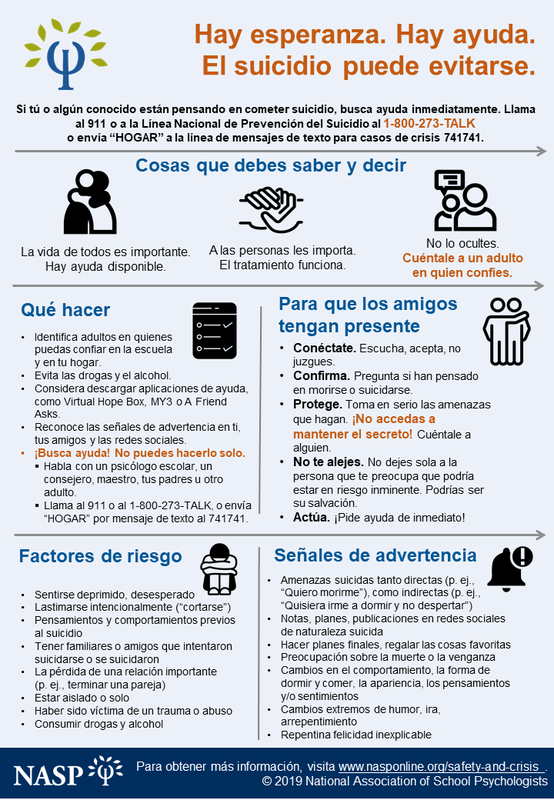 Never ignore these signs.While suicide is typically associated with the pain of mental illness (in particular depression and associated feelings of helplessness and hopelessness), there are sometimes specific situations that trigger suicidal actions such as breaking up with a boyfriend or girlfriend, failing in school, being bullied, or experiencing abuse, loss or other trauma. It is important to learn these warning signs and what to do if you see any them in yourself or a friend. Suicide is preventable. By listening, talking, and acting you could save a life. Suicide notes. These are a very real sign of danger and should ALWAYS be taken seriously. Threats. Threats may be direct statements ("I want to die." "I am going to kill myself.") or indirect comments ("The world would be better without me." "Nobody will miss me anyway."). Teenagers might make indirect threats by joking, comments in school assignments like particularly creative writing or artwork, or online through social media. Younger children and those who may have some delays in their development may not be able to express their feelings in words, but may provide indirect clues in the form of acting-out through violent behavior. Previous attempts. If someone has attempted suicide in the past, they are more likely to try again. Be very observant of any friends who have tried suicide before (especially those who have recently attempted suicide). Depression. When symptoms of depression include strong thoughts of helplessness and hopelessness, a child or adolescent is possibly at greater risk for suicide. Watch out for behaviors, comments or posts that indicate that your friend is feeling overwhelmed by sadness or pessimistic views of their future. "Masked" depression. Sometimes risk-taking behaviors can include acts of aggression, gunplay, and alcohol/substance abuse. While your friend may not act "depressed," their behavior can suggest that they do not care about their own safety. Final arrangements. This behavior may take many forms. In adolescents, it might be saying goodbye to friends, giving away prized possessions, or deleting profiles, pictures or posts online. Hurting oneself. Self-injury behaviors are warning signs for young children as well as teenagers. Common self-destructive behaviors include running into traffic, jumping from heights, and scratching/cutting/marking the body. Inability to concentrate or think clearly. If a friend is going through tough times, this may be reflected through classroom behavior, homework habits, academic performance, household chores, or even conversation. If they start skipping classes, getting poor grades, acting up in class, forgetting or poorly performing chores around the house or talking in a way that suggests they are having trouble concentrating, these might be signs of stress and risk for suicide. Dramatic Changes. Parents, teachers and friends are often the best observers of sudden changes in suicidal students. Changes can include withdrawing from friends and family, skipping school or classes, becoming less involved in activities that were once important, avoiding others, inability to sleep or sleeping all the time, sudden weight gain or loss, disinterest in appearance or hygiene. Sudden unexplained happiness (after a prolonged period of sadness) can also be a suicide warning sign. Know the warning signs! Read over the list above and keep it in a safe place. Do not be afraid to talk to your friends. Listen to their feelings. Make sure they know how important they are to you, but don't believe you can keep them from hurting themselves on your own. Preventing suicide will require help from adults. Make no deals. Never keep secret a friend's suicidal plans or thoughts. You cannot promise that you will not tell-you have to tell to save your friend! Tell an adult. Talk to your parent, your friend's parent, your school's psychologist or counselor-- any trusted adult. Don't wait! Don't be afraid that the adults will not believe you or take you seriously-keep talking until they listen! Even if you are not sure your friend is suicidal, talk to someone. This is definitely the time to be safe, not sorry! Ask if your school has a crisis team. Many schools have organized crisis teams, which include teachers, counselors, social workers, school psychologists and principals. These teams help train all staff to recognize warning signs of suicide as well as how to help in a crisis situation. These teams can also help students understand warning signs of violence and suicide. 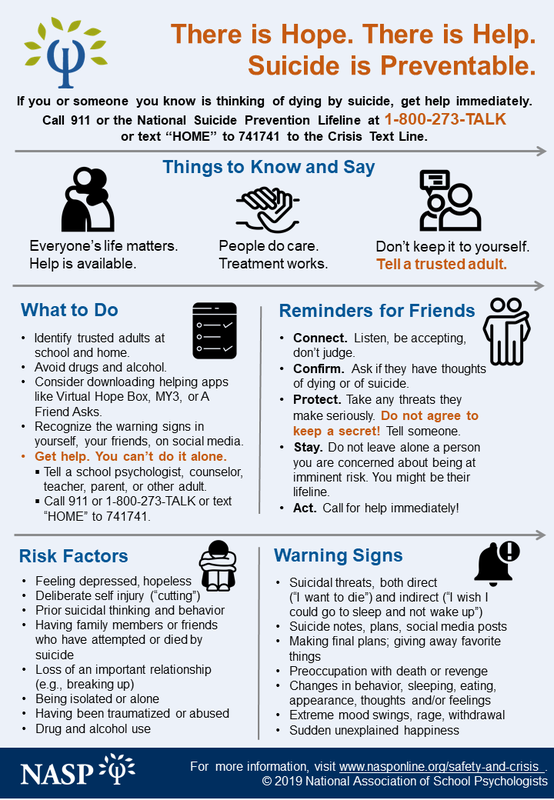 Whether or not you think someone at your school might be suicidal, find out if your school has a crisis team in place. If your school does not have a crisis team, ask your Student Council or faculty advisor to look into starting a team.